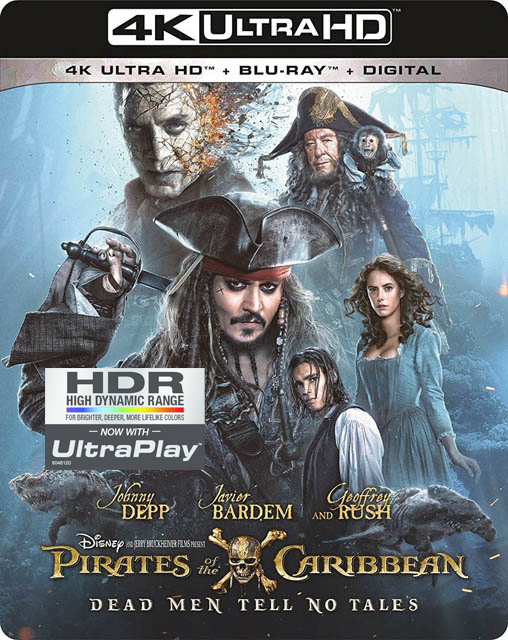 Clarity/Detail: Dead Men Tell No Tales comes with quite a lovely and deep 4K Ultra-HD image. The blacks excell and the colors, especially with filters and explosions are quite appealing. Details are very strong in the image with wood grains, dirt, rope threads, molten rock and more just looking good to the touch. Water comes on strong and seamless. Its got a more naturally colored image with good depth and details. The CGI has a hint more of looking more like CG, but its still okay because the strength of the texture and information in it is quite good. Overall, this is a beautiful image whatever the time of day or lighting in a dungeon. Depth: There is a good amount of spacing and dimensional work on showcase throughout the film be it indoors and outdoors. Camera movements and characters ones are smooth, cinematic and confident. The separation, especially when on a boat, of character/foreground and background is quite good. Black Levels: Blacks are wonderful here. There is a varied palette on deep it is. They are natural and dark, impressively holding on to details and enhancing the sharpness of a various other scenes. Hair follicles, clothing wrinkles, surfaces and more retain a lot of individuality and textures. No crushing was witnessed during this viewing of the film for the review. Color Reproduction: Colors come across quite beautifully. The wardrobes, especially Barbosa's crew and Carina’s dress. The purples, greens, reds and blues look lovely. Blues are a very strong color here with the skies and water looking gorgeous. HDR comes in hand with torches and the like. Dark cavern scenes really allow some of the colors to pop. During Salazar’s flashback, the red, flaming water reflection (Or whatever) really beams off your screen looking gorgeous. Flesh Tones: Skin tones are natural and keep a consistent looking picture from beginning to end of the voyage. Facial features are excellent with freckles, moles, blemishes, lip texture, wrinkles, leather sun beaten skin, dried blood/mud and a lot more. Barbosa’s face is probably the best example at how terrific the detail is if you pause and take a look. Shansa's face is also gruesomely detailed. The 1080p transfer looks terrific but this rendering takes it up a notch with a discernible increase in detail, and emboldened highlights, both light and dark. This is readily apparent in the sequence in the town square during chapter 12 and later when the trio of Jack, Henry, and Carina land on the island with the dead in hot pursuit. The beautiful earth toned colors, shimmering water, and stone buildings set against the sunny sky look terrific. Close ups reveal oodles of fine detail and abounding textures, especially on Salazar's ship. Wide angle shots and the contrasting cinematography, going from brightly lit exteriors to the variety of dark, shadowy sequences look great in Ultra HD. I found the application of high dynamic range to be spot on and quite complimentary. Some of the best examples of the presentation’s effective use of HDR comes during the finale where things escalate before landing on the hidden island, a scene which looks gorgeous. The HDR highlight comes during chapter 16 when Captain Salazar tells his story via flashbacks. The brilliant highlights in the muzzle flashes from the cannons, explosions as they find their mark, and the lighting that illuminates the sea/ships from above look terrific against the sequences sepia toned aesthetic. The scenes shot at night, or in the low light of dawn or dusk, are equally rewarding, delivering a noticeably dimensional image, with excellent delineation. DEAD MEN TELL NO TALES is an exceptionally bright, vibrant film and it shines through on 4K UHD beautifully. To be clear, it also looks great on Blu-ray, but the 4K release takes everything up a notch, from the brightness of the sunny seas to the details in clothing and facial features. The 4K also gives a pseudo-3D effect thanks to the increased definition and color depth, which was a nice addition. You’ll also get to see every detail in every bit of clothing for each character. Normally, that’s not a huge deal, but the costumes here are pretty elaborate and I found the added detail to be a welcomed improvement. ...Disney has certainly come out of the gate strong. ...Disney's debut UHD is terrific. High quality 4K/HDR video, a reference Atmos soundtrack, and a fair assortment of extras make this one of the year's top releases. Very highly recommended. ...we did do a side-by-side demo comparing the HDR/WCG 4K Ultra HD Blu-ray and the SDR/Rec.709 Blu-ray using two LG G7 OLED 4K displays (with all noise reduction and motion enhancements flipped OFF) and two Oppo UDP-203 4K Ultra HD Blu-ray players in a darkened conference room. 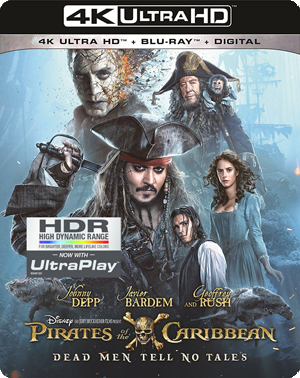 ...Make no mistake, the 4K Ultra HD Blu-ray DESTROYS the Blu-ray in every possible way (even when said Blu-ray is up-rezzed by what's probably the BEST 4K player on the market on arguably the BEST 4K display available today). 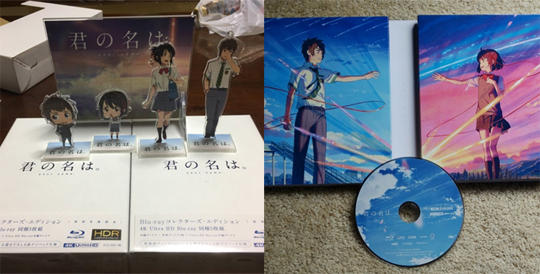 I'm not kidding or exaggerating. No hyperbole whatsoever. The difference is visible and dramatic. ...Guardians Vol. 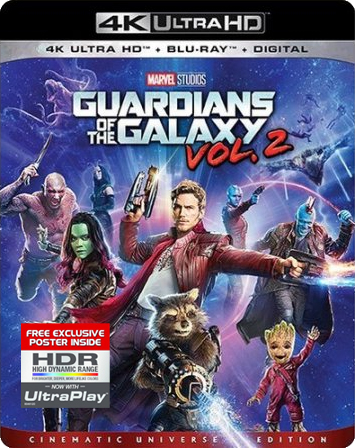 2 is probably going to set a new standard as the best, demo-worthy 4K Ultra HD Blu-ray the young format has ever seen.